It’s shocking! 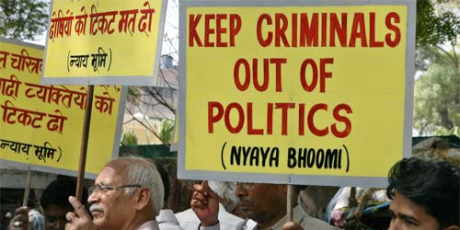 One in four Indian MPs has a criminal record or faces prosecution. But, an exciting new law could change all that, if it gets enough public support. Union Law Minister Salman Khursheed has drafted a bold bill which would make it impossible for any convicted politician to run for office or remain in parliament. But corrupt politicians threatened by the bill plan to derail it at an all party meeting in a few days time. Only we can stop them with a massive public to party leaders to support the law. 162 MPs in the current Lok Sabha have convictions or are being prosecuted, on charges that range from corruption, through murder to spreading communal hatred. These aren’t the type of people we want to represent us, and they are running our government into the ground. This week India’s auditor general said the ‘credibility of government is at its lowest since Independence’, partly because ‘we have Members of Parliament who are being indicted by the judiciary for various acts including accepting cash for exercising their vote in Parliament’. There is already a law in place to kick corrupted MPs out, but some criminals are using a loophole to stay in office — they get a stay order on their conviction so that they can stand for office again. To get rid of them once and for all we need a strong election law that bars any convicted person from holding office, until and unless they are finally acquitted on appeal. Together we’ve made great strides towards the Jan Lokpal legislation, but corruption cannot be defeated with crooks in power. This is our best chance in a generation to clean up our politics. But MPs with something to hide will use all kinds of tactics to try to block it. We need to use the same strategy that forced through Lokpal — targeted and massive public mobilisation. Let’s start building a movement now! Last year Brazilian members of Avaaz forced the government to pass a bold anti-corruption law barring tainted politicians from office. We have seen with the Jan Lokpal movement that people power can force the government to sit up and make changes. We will watch every move of the government while this law gets drafted, placed in the parliament and passed. Together we can make India’s political system free and clean.